The Peopleâ€™s Library is the collective, public, open library of the Occupy Wall Street leaderless resistance movement. There’s a lot going on in the news lately. It’s a busy time of year. Several people have sent me this image over facebook and elsewhere. What people may not know is that there is a library at Occupy Wall Street and one at Occupy San Francisco. And possibly more. Like many other temporary autonomous libraries, details are distributed and not always accurate. I suggest, for interested folks, keep an eye on the People’s Library blog (specifically this call for librarians if you want to get involved and these library ground practices) and get in touch with the folks from Radical Reference tonight if you’re in NYC. If anyone knows of either Occupy Ann Arbor or Occupy Milwaukee have libraries, please drop me a note. I’ll be on the road for a little bit. This is a librarian at the richest, most pretentious school in the country, Horace Mann. … You do the math. O hai self-loathing! Why on earth is this true? Actually, the richest school in the country is Phillips Exeter Academy. And their librarians start in the high $30Ks/low $40Ks… so… you do the math. Rich school does not equal rich librarians. Beyond that… puh-lease… in general, librarians are some of the most liberal people out there… they LOVE to protest for any liberal cause (even if that cause is not clear.) This sign only means something when taken in the context of the librarian stereotype … that librarians are conservative and mousy. 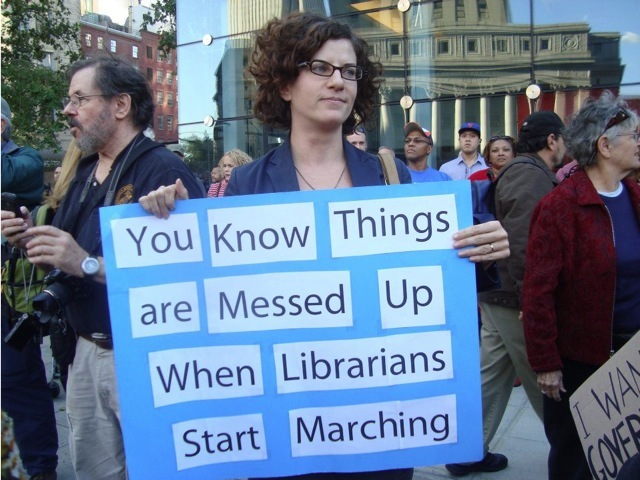 In reality, protesting librarians are nothing unusual and not a sign that things are messed up. Librarian is the important people.